Easter is quickly approaching! Oh, I’m so excited to see if the Easter Bunny leaves me some chocolate! My favorite Easter chocolate has always been the chocolate bunny with the crispy rice inside. Oh yum! I’m drooling just thinking about it! Does your family have any fun Easter traditions? My son is at the age now where he could actually participate in an egg hunt so we’re really looking forward to seeing what the Easter Bunny has in store for us this year. Whatever he has planned, I know it’s going to be fun! Does your family play any Easter games? How about making Easter crafts? We haven’t decorated eggs with our son yet but we’re excited for this new family tradition to start this year. I’m sure it will be messy but fun. Be sure to stop by our special Easter Activities page for loads of ideas for Easter parties, Easter sweets, free printable games, activity ideas, and much more. 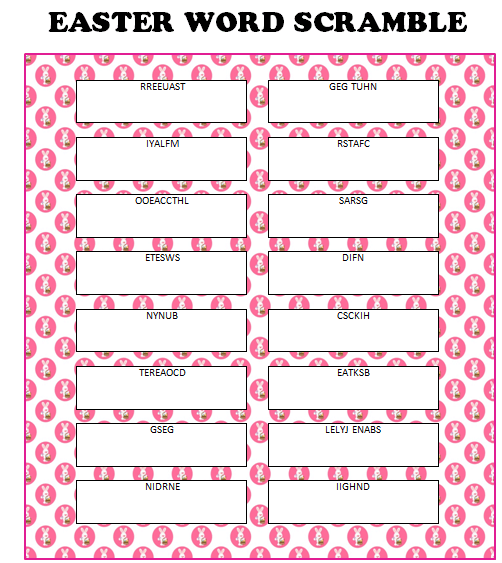 Today I’m sharing a free printable Easter Word Scramble game. Simply look at the scrambled word (or words) in each box and try to unscramble it in the white space below each scrambled word. I’ve also included the answers on the bottom of the free printable page. This is a great game to play on the days leading up to Easter or as a quiet activity for the kids to play on Easter Day as you prepare your family meal. Don’t forget to visit our Easter activities page for more free games, sweet treats, recipes, party ideas, activities, free printables and more! We’re always adding new ideas for family fun. Be sure to follow us on Facebook, Twitter, Pinterest, Google + and Bloglovin’ for the latest updates. Printing this for my 1st grade daughter to help with her reading and writing. Visiting from The Creative Exchange party.